I haven’t made games for quite some time now, focusing mainly on ReactJS and Web Development, so I thought it was a perfect time to join. While I have a lot of experience programming and joining accelerated development events (winning quite a few in the process), creating a game where I was responsible for everything (I usually work with a team of artists/musicians/etc) would be quite a challenge. Ludum Dare events are tied to a theme, and the theme for LD41 was “Combine 2 Incompatible Genres”. I can’t lie that the theme caught me off guard - previous Ludum Dare themes tend to be based on ideas/keywords (i.e. ‘Growing’, ‘Alone’, ‘You are the Villain’). 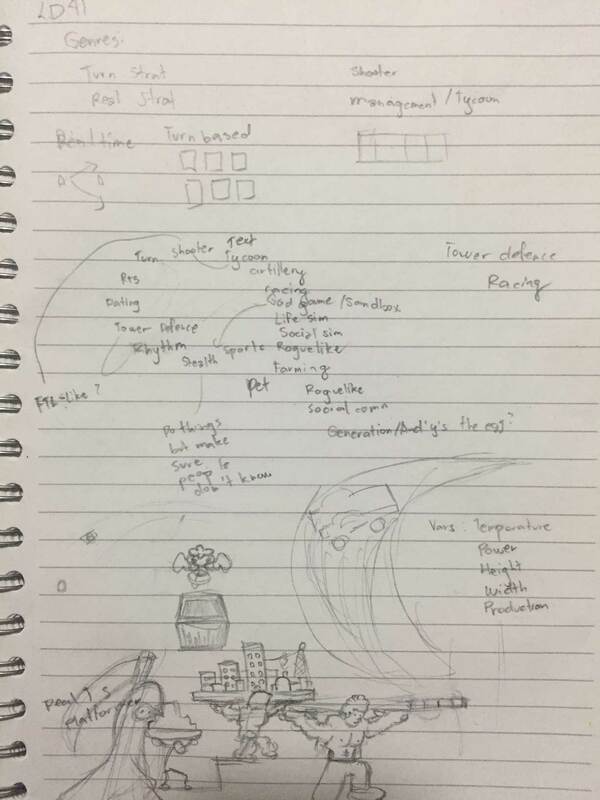 After a quite involved brainstorming session, I eventually settled upon platformer and tycoon/real time strategy genres. Towns in RTS games can’t move, while platformers are inherently rooted in movement, and this odd combination lead to eureka moment of having the platformer needing to ‘move’ the town, with each ‘genre’ affecting the other. I knew I wouldn’t be able to implement everything in 48 hours (mechanic wise probably, but art was the tricky one), so I opted to pace myself properly and at least complete a subset that would lead to reasonably interesting vertical slice. Programming was easy for me, but art and music was another story. Despite this, I wanted to challenge myself in all areas, and that meant using the time to experiment with my tools and workflows. Phaser is a powerful and popular HTML5 Framework that I’ve used multiple times already, both for my own games and for contract work. Its newest version Phaser 3, is an entire new beast altogether. It is a complete rewrite that had only been released about one and a half months ago, and I was eager to try it out. Phaser 3 continues to be an awesome framework, with some of its newest additions proving to be essential in my game. The camera system is a lot more powerful, groups are now logical containers/object pools, the display list is now flat (which results in performance gains), and depth management (z-sorting) is a lot easier to manage. There’s also quite a lot of improvements on overall management, with lifecycle, input, scene and animation registration much easier to work with (and probably faster with the way it’s written in now). There are however some snags I hit along the way. As a rewrite it still had some features from Phaser 2 that was missing, and the documentation was useable, but not as great as it could be yet. There’s quite a lot of abstraction going on with Phaser and how it renders things (which is just fair, Phaser 2’s renderer was Pixi), but it seems to be plenty powerful with support for custom rendering pipelines. I wasn’t sure how I could capture buffers and postprocess them, but it seems to have primitives that could facilitate if I digged into it more. Overall, I found the entire development experience positive and I find myself very happy with Phaser. For Art, I opted for pixel art with Aseprite as my tool of choice. 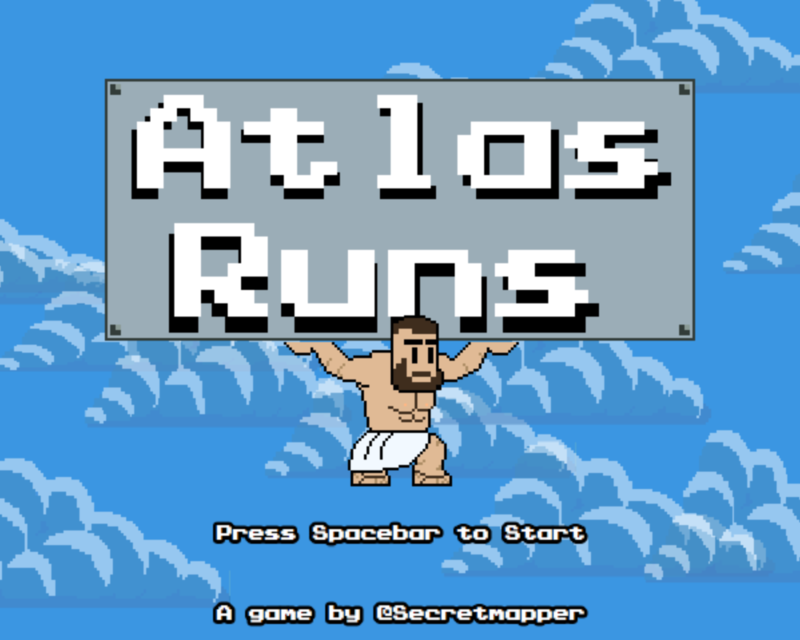 I really liked the look of Atlas in the game - he has chunk and heft, but it did present a challenge - he had too many pixels! This increased the complexity of the art I needed in the game, since consistency would mean that I needed high resolution for the other sprites as well. For asset management and preparation, I wrote a quick script hooked into my build process that would export the frames from aseprite, pack them into a texture with TexturePacker, and spit them out to my assets directory. Music was the least worked on part of my game - I ‘composed’ it near the tail end of the compo in the last few hours using bosca ceoil. At first I wanted to create a more ‘epic’ and theme appropriate music for ‘greek myth’, but Chiptune allowed me to at least create something quickly enough to add into the game. For sound effects, it was just me recording myself and applying some editing on post. After the sound effects were done, it was off to deployment! I opted to put the game up through surge - quick and easy! Experimentation - this isn’t so much as a ‘wrong’ - I came into the compo wanting to experiment (hence Phaser 3 for example). However, it did slow me down a bit, with me having to look into the source for documentation and having to rewrite some stuff due to misunderstanding how the framework functions. Complex art design - my design for Atlas had too much definition. While he looks okay, the rest of the art had to suffer. It probably would have been better to stick to 16 bit sprites - this would have allowed me time to make more and better looking assets. Workflow - despite not developing any games in recent memory, my extensive experience with webpack and build scripts/pipelines made it smooth/easy for me to add create tooling for my workflow. Pacing - I was able to complete much of my original plan into the game - I knew exactly what I was going for, and properly planned for some roadblocks I might have faced.